Just a little about Grayguns - https://grayguns.com. We offer precision upgrade components and in-house services for your SIG SAUER® pistol AND we're the premier action-work specialists for HK pistols. Our Expanded Services Division continues to grow! This post is monitored by Grayguns' staff members, but if you have a question about a product or service, you may find contacting us via email your best option. Thank you to everyone at SIGForum for supporting Grayguns! 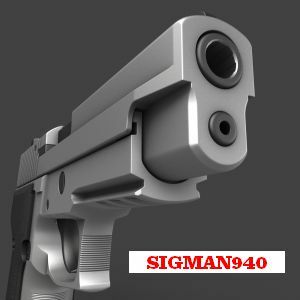 Specifically designed for the SIG Sauer® classic P-Series DA/SA pistols. The Enhanced Daily Carry (EDC) with Straight Optimized Trigger (SOT) reduces DA and SA pull weights with dramatically improved pull characteristics. This kit is compatible with the SIG Sauer P226, P229, P228, and P227 pistols with the larger DAK-capable frame window cut. Please read the full description on our website. If you are looking to upgrade your SIG Sauer® P365, while providing a firm grip for carry, this is an affordable way to get a customized module. The texture and feel is great, providing just enough grip while not catching on your clothes. 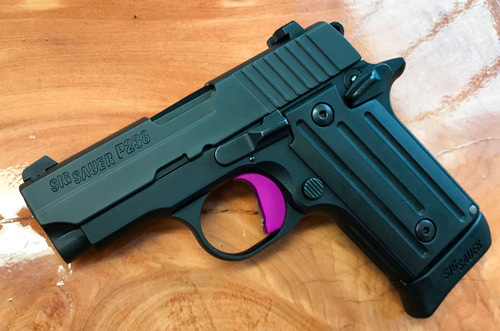 If you are looking to upgrade your SIG Sauer® P320, while providing a firm grip for carry or competition, this is an affordable way to get a customized module. Offers an improved shape and a better feel for your SIG P238 and P938 micro-compact pistol. 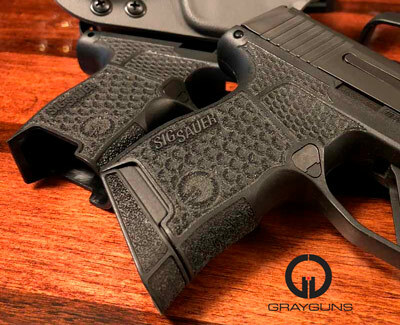 The Grayguns Enhanced Trigger offers an improved shape and a better feel for your SIG SAUER® P238 and P938 micro-compact pistol. Nice kit Bruce. Only one question, what is the difference in the SD sear vs the competition sear? The competition sear offers a lighter single action pull weight acceptable for competition and range use only. 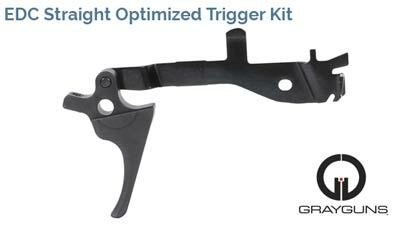 Will the straight trigger drop in to a P226 previously worked on by GGI? It had the Reduced Reset Carry Package and SIG Short Reset Trigger done. Steve, I know that the competition kit comes with competition springs (I own a few spring kits myself), however, I am just wondering if there are any differences in the sears themselves? If not, theoretically, I could revert my pistol back to the SD setup if I chose to do so (eg. replacing the standard springs). Thanks! Yes, the sears are physically cut differently. Steve, that makes sense. Thanks for the clarification. What's the progress on P320's that have had the GrayGuns love (competition action package), as well as later PELT installation? Are these going to be serviced to make them "drop safe"? I hesitate to send a modified gun like this back to SIG for their standard mods. 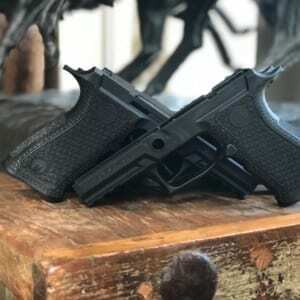 Do you have the expected trigger pull weights for competition vs duty kits? Both DA/SA. In development, but no ETA. This is a Classifieds thread, and not really appropriate for questions outside the thread's topic. That said, you should have received an email on the topic. That information was also posted on the Grayguns website. When additional information is available, the website will be updated and you'll receive an email. The are working on it. I expect it will vary depending on the gun, but they have not provided me with that information. They have been installing kits on guns for a couple of months, so maybe someone will provide a report. Any idea when the drop in HK p-series bits on display at the NRA show might become available? Anything more about the fire control kit you mentioned in the post below? There's nothing on your web site. I think Grayguns would like to keep this thread specific to the items listed in the first post of the thread. As for additional products released in the future, you can consider anything you've seen but not yet released as "in development, with no current ETA." The small, dedicated staff continue to work on new products. I think the consensus is they want to avoid promises for release dates in the future. Under promise, over deliver. When stuff is released, they will not be hiding it. Sign up for the email newsletter at the Grayguns site and/or watch the website. Are you doing any 1911 work again? I've got a Colt 1911 that was given to me by a dear friend that passed away a couple years ago. I can think of no more fitting tribute than to have a premier smith give it some love. Any chance you'd take on such a project now? This is a Classifieds thread, and not really appropriate for questions outside the thread's topic. That has a 'topic shortcut' in the pistols section... for discussion. I think Grayguns would like to keep this thread specific to the items listed in the first post of the thread. More information on Grayguns products and services can be found at our website - https://grayguns.com. We offer precision upgrade components and in-house services for your SIG SAUER® pistol AND we're the premier action-work specialists for HK pistols.